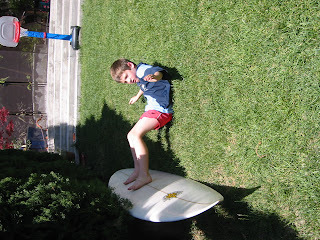 As the school term is coming to a close, there are a lot of end-of-term activities. One of these was the Open Day last week. 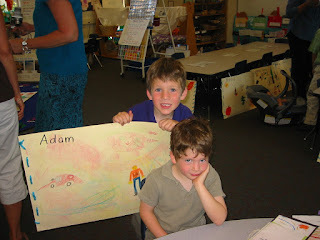 Finlay and I went along to see samples of Adam's work during the year, to look at the classroom displays, and to hear Adam's class (but not him*) sing. Actually Finlay did enjoy himself at the Open Day. He himself is looking forward to going to school because he wants to be a scientist and do experiments. 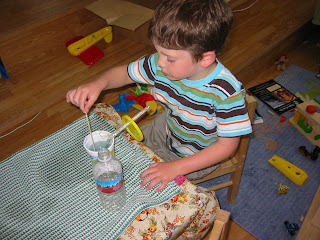 Here he is performing experiments with water! * Adam was supposed to be singing along with his class. However the breakdown was: all girls singing enthusiastically with actions; most boys bunched together singing inaudibly; Adam in silence mouthing occasionally! Well, I seem to have shaken off my knitting ennui of last week, but Rosemary is still in my head. I dont think I have enough of the orange cotton/linen blend to knit it, and am wondering if I could knit it top-down to knit as far as I can get before I run out of yarn. Hmm...not sure my pattern alteration skills are really up to that. I suspect the skirt would be best knit in a firm dense fabric with something like cotton or linen, but I dont want to knit it in Rowan Denim so am pondering the alternatives. I also dont want to spend a huge amount as I'm fairly sure a knitting skirt is not going to get a lot of wear somehow. What do you think about this yarn from Elann ? It certainly comes in some lovely colours. Wear the protective gear Kids! 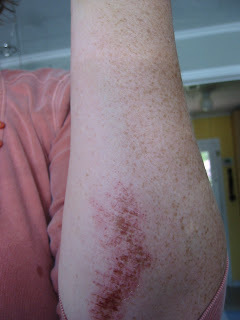 Not only do I have this graze, but ive also got bruises on both knees, and a sore shoulder. I knew I should have carried Adam's scooter back from school instead of riding it. Im in a bit of a knitting funk at the moment; I've got things on the needles, but I dont really feel much like knitting any of them. Im knitting some socks with some chartreuse elastic cotton yarn, the elasticity makes it quite hard to get a rhythm going. The finished product seems nice, but the process less enjoyable. Im knitting on the Estonian Garden Shawl, but it's a new pattern, and requires a lot of concentration. I don't get many chances to knit and concentrate at the moment. I think it will look great (if) when I ever finish it. 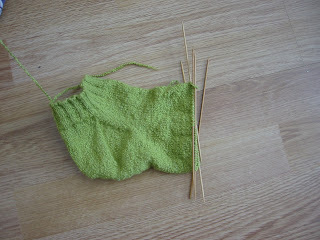 I'm also working on some secret knitting, its very slow as I seem to knit for hours with nothing to show for it. Also, one of my knitpicks circulars that I was using for this broke this week - so it's on hold until the replacement knitting needle arrives. I think the solution is to cast on for a quick and simple knit, so Ive dug out the pattern for Rosemary from the Summer Tweed book, scroll to the bottom for a picture. I have not got the correct yarn, and the cotton/linen mix that I plan to use is not the right tension so some swatching will be required. That's the plan for this weekend. Adam lost his first baby tooth yesterday. He was so excited. He lost it during recess and had to go to the office for a "tooth box" (pictured). 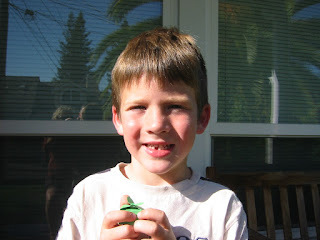 The tooth fairy bought him a Sacagawea_dollar to save, and a dollar to spend. 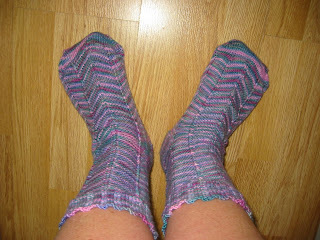 I finished Gill's socks. Another pair of Jaywalkers, this time in Socks that Rock Lightweight in colour peaseblossom. I did modify the pattern for a shorter toe, and it's a good job that I did because I ended up with about 1 yard of yarn left over. I love the way that the Jaywalker pattern is elastic so has a nice close fit. I prefered the lightweight STR to the medium too. I knit these on my lantern moon dpns which are 2mm. 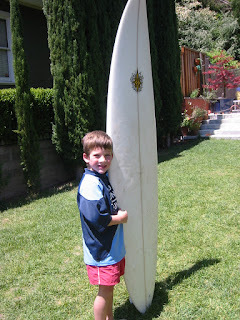 The boys sold some of their old toys, so the surfboard is jointly owned by us all (this is very important when you are six). 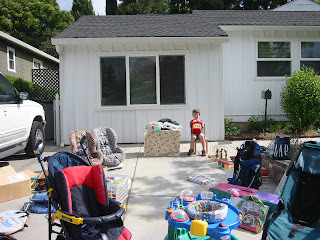 The sale was surprisingly successful and very sociable as our entire neighbourhood was about swapping, selling, and chatting. I just saw this on PurlyQueen's blog and thought it was fun. Also, I dont have any real knitting content as I'm still ploughing through Gill's Jaywalkers. Knitting with Linen - waiting to be knitted up! Tubular Cast-on - dont know, may have done! I guess the fact that Ive been knitting for close to 30 years explains why the list is so heavily in the "have done" segment. I think the idea is to take a drink with every option that you have not done, but instead I'm just going to have a drink anyway....cheers! 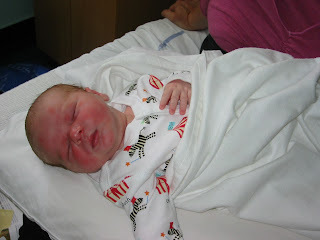 On Monday he celebrated his first birthday. 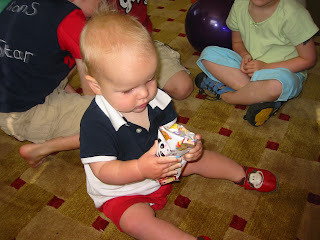 He seemed to get the idea of presents remarkably quickly and resisted any attempt to help him open the gifts. 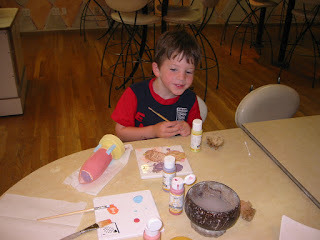 After breakfast, presents and playing with balloons, we headed down to town to Petroglyph for some crafty birthday activities. Finlay painted a spaceship money box. Nancy painted a cupcake trinket box. 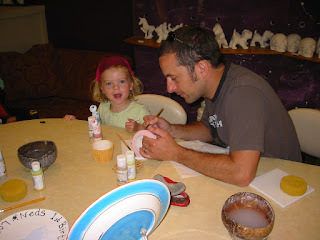 Gill and Ned painted a plate. and of course we ate cake from Icing on the cake . Ned made the excellent choice of banana cake. 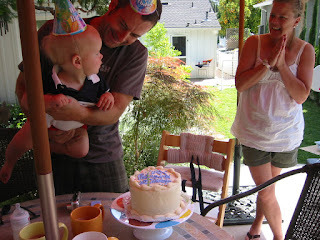 Happy Birthday Ned, I'm glad you were able to celebrate with us in California. While our visitors were here I took a weeks vacation. 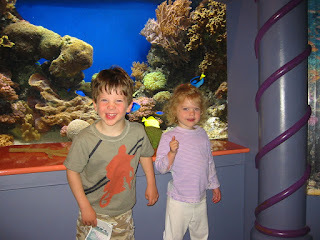 We took the three youngest to the Monterey Bay Aquarium. It really is such a fabulous aquarium. 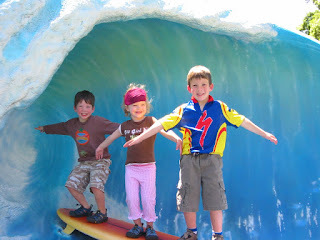 They liked the Splash Zone which is specialy for children. I liked the 'Wild about Otters' exhibit and of course my favourite is watching the Sea Otters. (A particular highlight was watching the otters poo right where we were standing...Finlay was thrilled as you can imagine). 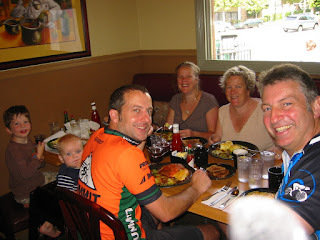 Nigel and Andy did a long bike ride over Overlook to the Lexington Resevoir and we met them in the LG cafe for breakfast. and again, back home to take advantage of the great weather. Here we are doing 'display team'. ps Nancy was heard to describe something as "Awesome" while visiting. 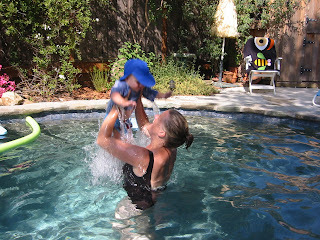 The last few weeks have been packed full of activity with no time for blogging (or apparently cleaning my house). So, what have we been up to? 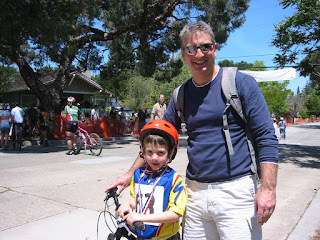 Adam entered the children's race of the Cat's Hill Bike race. It was fun to go and watch, and we stayed to watch some of the adult races which turned out to be very exciting. Adam had a cautious start to the race, and Nigel ran alongside him on the course - but I think next year he might be more confident to actually race. He had a good time though and was pleased with his medal. 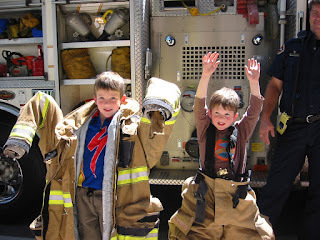 The fire brigade was also at the Faire and the three oldest got a chance to sit inside the engine. Adam and Finlay also got to try on the firefighter clothes, they were shown how to step straight into the trousers and boots. In sadder news; we had to let the ants go. 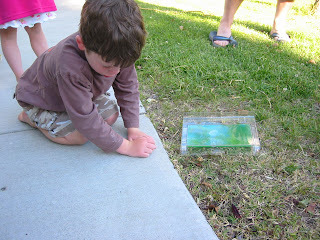 After Finlay dropped the ant farm we were down to 3 rather sorry looking ants and the gel developed mouldy patches. Finlay was very sorry to see them leave as we released them near their nest. I had to promise to build another ant farm, but so far he seems to have forgotten, and I'm not saying anything! 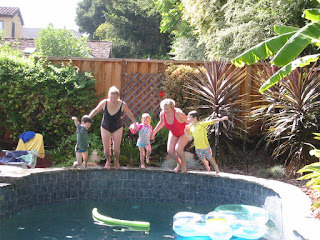 At the weekend we made another trip to Wilder Ranch. Gill and I walked with Ned, the others rode bikes to Landing Cove. 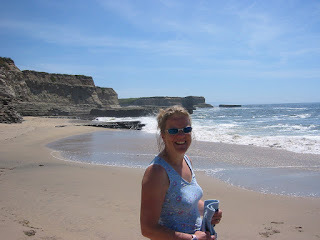 The weather was gorgeous and we ate our picnic on the beach. 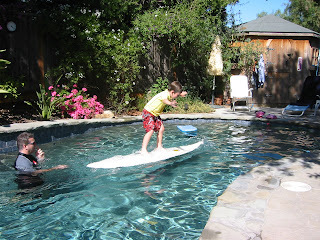 The children played in the surf before we headed back home to the pool. Continue reading for the next installment.